It seems that Selah Marley inherited not only the talent from her mother, but also the beauty. 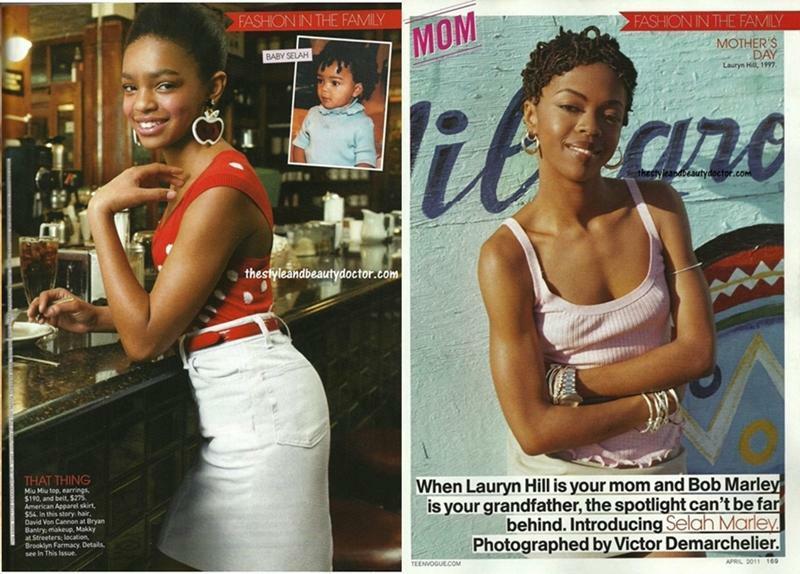 After she already tried and enjoyed the music field, Lauryn Hill’s daughter debuts in modeling and she pose for the Teen Vogue April cover. She is photographed by Victor Demarchelier. What fits Selah Marley best? Singing or modeling? At her 12 years old, the girl is really something but what do you expect from the famous Lauryn Hill daughter and the same time granddaughter of Bob Marley? With such famous and talented people in her family it was actually odd for her to do nothing. Asked about her future plans, little Sellah told she wants her own record business and maybe a musical career. She’s not decided yet, but she definitely has a lot of time to do it, considering her age. For now, Selah is testing the water in both singing and modeling career. Actually, Teen Vogue described her as a singer and model with talent in her genes. Meanwhile, the beautiful little girl spends most of her time at school, doing her homework or with her friends. She’s also a bright student, what could you ask more as a parent? In the Teen Vogue article it’s mentioned that Selah Marley it’s a very big fan of Justin Bieber: “I am a huge fan of Justin’s. I love his personality, and his looks just take the cake.” she said. About her mom and her music, Selah has a profound respect: “I like her music. It’s very truthful” an regarding the music of her grandfather she said that: “His songs are very soothing.” When your mother is Lauryn Hill and your grandfather is Bob Marley, you were definitely born with greatness in your blood.